Werner von Siemens’ mission to lay 50,000 nautical miles of transatlantic cables might not have been destined to fail – but at least one business rival tried to make sure that it would. It wasn’t enough to merely execute a risky project that had never been done before. The crew aboard the Faraday, the ship that Siemens and his brothers commissioned, also had to move faster than saboteurs who planted false reports in the press and even broke cables. And it was in this pressure-filled environment that Siemens turned to another recent invention of his to enable his crew to work around the clock: a electrical generator, placed on the deck, to light up the night skies. This spirit of deploying new technology and innovation on the high seas is just as relevant 143 years later – even if the challenges are much different, which thousands of leaders from the maritime industry, including naval architects, shipbuilders and owner/operators talked about recently at the International WorkBoat Show in New Orleans. 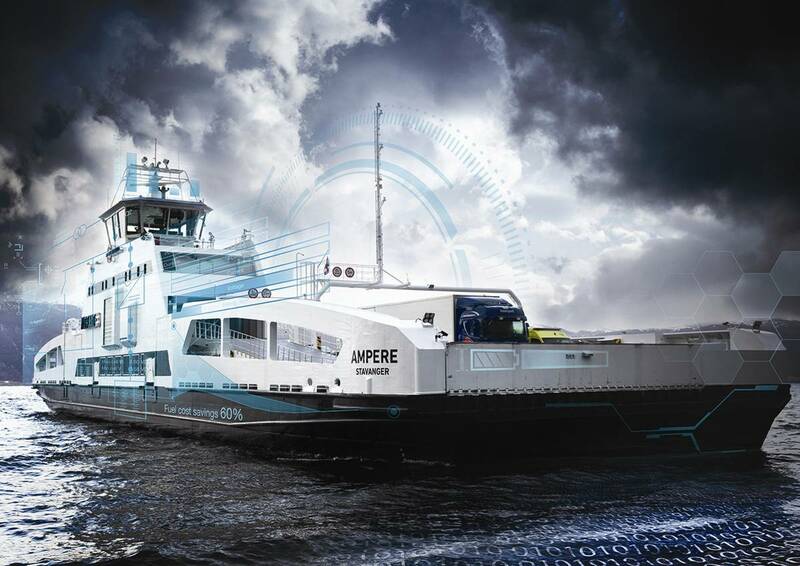 Today the marine industry is working towards solutions for propulsion, environmental regulations, safety standards, and global trade by embracing the technological advancements currently reshaping the industrial world: what we call Industry 4.0. Industry 4.0 is the fourth industrial revolution where the brainpower that has gone into creating apps for smartphones is creating applications for smart factories. An array of new tools emblematic of the digital transformation – advanced robotics, 3D printing, design software, and big data networks connecting people, machines, systems, processes, plants, and customers -are enhancing competitiveness globally and meeting rapidly changing customer demands. Siemens’ customers embracing digital enterprises are experiencing a 50 percent reduction in time to market, a 30 percent reduction in engineering costs, and 50 percent higher throughput. But this isn’t just happening in factories; it’s happening in the marine industry. This year, the world’s first electrically-powered car ferry went into service, taking vehicles and people four miles across the Sognefjord in Norway. And it had zero emissions. Batteries are charged on each side of the fjord with electricity, provide from a mix of the country’s renewable resources such as hydro and wind power. Another Industry 4.0 development is using one common platform to collect and consolidate operational ship data from different system suppliers and in common data formats in order to supply applications via a simple and standardized interface. The applications can help optimize ship operation and performance. For example, software is used to transmit vast amounts of ship or event fleet operational data, back to an onshore control center for analysis and optimization. Monitoring systems at sea allows for quick response to issues, thus increasing reliability and uptime, while reducing costs. We also see Industry 4.0 influences in the port of Dutch Harbor, Alaska, location of the Discovery Channel’s popular reality television series, Deadliest Catch. The recently commissioned Blue North commercial fishing vessel is now operating out of Dutch Harbor and is now one of the world’s most highly automated ships, able to catch, process and package fresh cod on-board in a Industry 4.0-like factory on the seas. Finally, product lifecycle software (PLM) is being used to design the most highly complex ships. Performance and build-time is sped through the collaboration of designers, engineers, production specialists, partners and suppliers, so shipyards can optimize performance. While on the seas, operators are using advanced software to integrate all operational equipment through seamless and controlled data acquisition. 143 years ago, a technological solution, borrowed from another industry, enabled the Faraday to thwart its antagonists and launch a new era of global communications. But take notice in 2017: the ocean economy is estimated at $1 trillion, and the world’s oldest industry is bringing Industry 4.0 to the high seas to boost resource efficiency, reliability and productivity. David Grucza is Director, Siemens Drilling & Marine, U.S.